What exciting and worrying times they must have been. The build-up to, and preparations for, any historical battle on home soil must have been quite an experience for all concerned. The influx of fighting men into what were often small, rural backwaters, the drain on local resources, the fear of defeat and the aftermath – to say nothing of the small matter of loss of life. 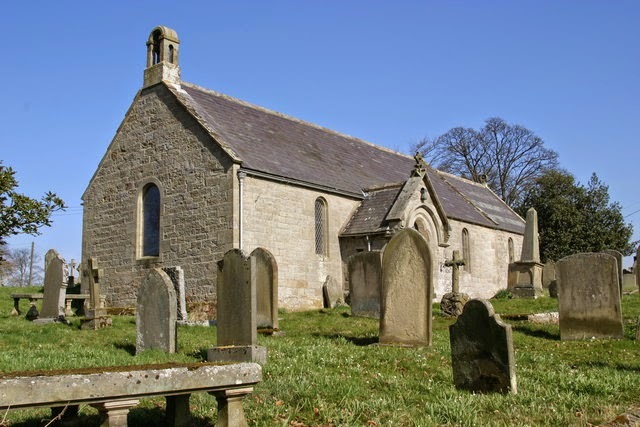 And in September 1513, the villagers of little Bolton, near Alnwick, braced themselves. For it was here, in the days leading up to the immense battle at Flodden Field, that the English army descended for their first full muster to the number of some 26,000 men. The leader of the English army, Sir Thomas Howard, Earl of Surrey, arrived at Bolton on 3rd September 1513, some six days before hostilities, where, the following day, “all the noblemen and gentlemen met with him with their retinues … among whom were Lords Clifford, Coniers, Ogle, Scroope and Lumley, Sir William Percy, Lionel Percy, Sir George Darcy, Sir William Bulmer of Brancepeth Castle and Richard Tempest Esq.” All of the aforementioned (and a few others besides) would have crammed into little Bolton Chapel on a number of occasions to offer up prayers for the fighting ahead. They stayed for a couple of nights before moving further north to Wooler Haugh, and thence to Barmoor and beyond. Then, on 9th September, Surrey and his English forces inflicted a crushing defeat on the Scots in the largest ever battle between the two kingdoms … and the villagers of little Bolton thereafter picked up the pieces of their quiet existence. Would you like to write a post for the 'North-East History Tour'?